JT McCormick from Houston, who marched with Capital Regiment in 2002 and will again in 2003, submitted this one: "This picture was taken in Madison, Wis., on Aug. 8, the night of Division II finals. As the guard warmed up for one of its defining performances, things were looking amazing -- check points, body movement, performance -- it was all working together, proof of our awesome instructors and the technique that was drilled into us from day one. "Pep talks from the staff: "Have fun, perform, don't forget what you've been taught, USE YOUR HEAD, and USE YOUR HEART;" Jamie Oakley helping us control our hype and soothe our nerves; us, the performers ourselves -- "I'm there for you, be there for me" – "I need your strength tonight." 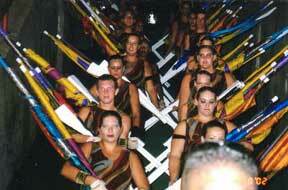 Then, as the previous corps exits, we make our way down the tunnel . "As you can see in this picture, there are some that are happy, some very calm, and some serious, but all of us -- ALL OF US -- were focused on that field. And when we came out of that tunnel, we added the energy of the crowd to our own. Pita, in front, started the flagpole chain reaction back to the rest of us, who counted down to the "HEY! "This ritual seems to have an extra special meaning this night -- these are the moments that drum corps is made of." Thanks JT! View the Forzato archives E-mail your Forzato submissions to dave@dci.org along with where and when the photo was taken, and send some biographical information about yourself as well. We'll give you full credit. Also, let us know if you want your e-mail address included, to get feedback from other drum corps fans.